There is no getting around it. Whole foods are the best foods. Not only will whole foods help you feel and function better, but they will also help you to recover as well. So what better way to fuel your body than with a home cooked meal? So, let’s set ourselves up for success shall we? Opex Fitness has six tips that I follow every Sunday on my “off” day that keeps the task simple and effective for me. Buy what you need. If you can, shop throughout the week in order to ensure you get the freshest ingredients (and aren’t throwing out things at the end of the week because they went bad). Do your bulk food run maybe once per week to buy meats to make in bulk, lots of leafy greens, fruit, and anything else you go through a lot of. Then throughout the week, pick up more fresh veggies or more meat on the way home to cook. I used to throw things away frequently because I was buying too much at the beginning of the week. Now I stick to cooking my bulk food items (Meats, Rice, Potatoes, Breakfast Casserole) on Sunday and now that Forge-Rx has Fry Farms coming in on Tuesdays I buy my veggies from them and cook them up throughout the week! Go Big. Get a Costco membership to do your ‘bulk’ shopping (meat you can freeze, some fruit and veggies, even frozen veggies). Also stock up on some good, sturdy tupperware. It is more expensive to do this upfront. But if you are serious about meal prepping this will be the most cost effective. You get more bang for your buck and you can also freeze the extra meat for example and use it for the following week. Be prepared; but not too prepared. Don’t prep too much at once. I’ve pre-packed an entire week worth of breakfast/lunch/dinners and end up not eating them like I should because something came up or by the end of the week something didn’t mix right. For example, guacamole will get brown by the end of the week and olive oil will make your lettuce mush. Easy solution? Pick 2-3 meats a week to prepare in bulk with minimal or basic seasonings like onion and garlic powder so you can transform them for any meal later on. This is where Fry Farms has really benefited my meal prepping. It is different every week, My meats are already cooked and all I have to do is throw in my organic veggies to the bulk meat / potatoes I already prepped on Sunday. Keep it simple. Simple is best. Rice, chicken, veggies, fat source – boom! Don’t try pulling out a cookbook and finding a different recipe for each day. Keep your meal prep simple. I couldn’t preach this more. The more simple it is, the easier it will be to follow through with. Have a Few Go-Tos. Have a few default meals on hand to always go to when time is short or you need food NOW. Pick foods you enjoy, and rotate them on a weekly or biweekly basis to keep interested. It’s easiest to decide on a menu, make it for every day that week, and then switch the next week to something new. Chop up onion, green, red, and yellow peppers, leafy greens, zucchini, squash, Chicken Sausage. Mix all together, then mix in 8 whole eggs and 3 cups egg whites. Into a large Lasagna pan (I use the aluminum pans; which means less dishes for me to clean) Pop into the oven at 350 for about 20 minutes. Dice up big bag of red potatoes. Add in 2 tbsp EVOO, Fresh Rosemary, Fresh Thyme, 2 TBSP Minced Garlic, Salt and Pepper – place in Oven at 450 and cook for 20-25 minutes. Cook big quantities of foods you know you’ll need in advance.. for instance that’s mostly breakfast and lunch for me. Divide those meals up into Tupperware so when you are on the move it is easiest to grab them and go or stick them in a lunchbox. Keeping some of your ingredients fresh is always a great idea. If you’ve prepped and cooked your meats and starches for dinner on your off day, then all you need to do is throw them in a skillet with some fresh veggies and dinner is made! Try not to over think it. 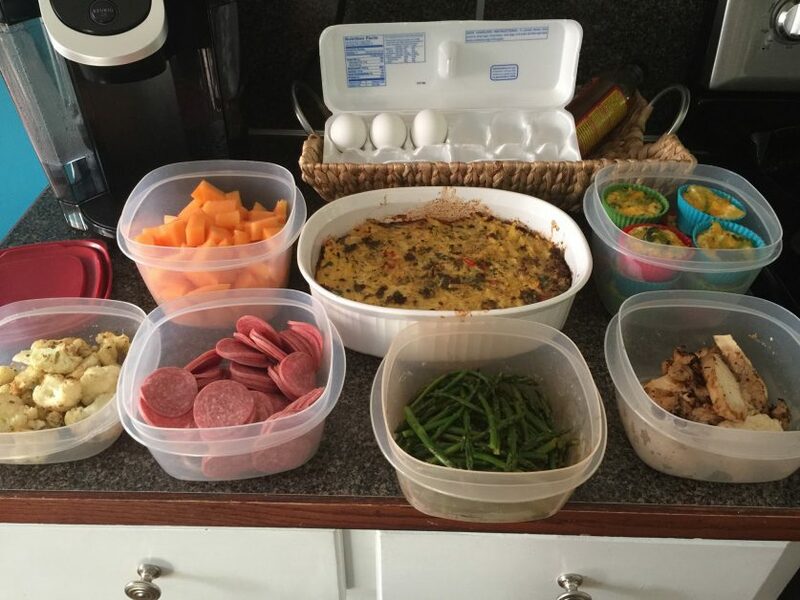 If you still aren’t quite sure.. prep for just one meal for week and go from there. Baby steps in the right direction will lead the way for more progress!